We are pleased to introduce you to 1600 for Men®- Formulated with the finest of ingredients including naturally derived botanicals and skin enriching vitamins. 1600 for Men™ is produced in small batches, packaged and labeled with simple elegance and bears the most significant mark of the free world-The Presidential Seal of the United States. From fine cologne to moisturizing body wash to fabulous Kits on the Go this line of products was created to please the senses on every level. Our 1600 for Men® signature scent is crisp, cool and masculine created for “The Man” of the house. TSA Toiletry Travel Kit, powerfully presented in our sturdy vinyl bag with zipper closure. The deal for 1600 for Men was apparently arranged last year by the Secret Service’s licensing agent in California. 15% of retail sales goes to charities and families of Secret Service personnel. 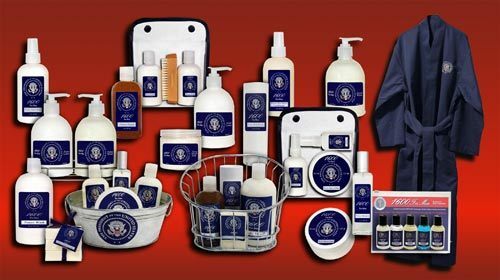 1600 for Men is available online and in The White House Gift Shop at the National Press Club building in Washington DC.